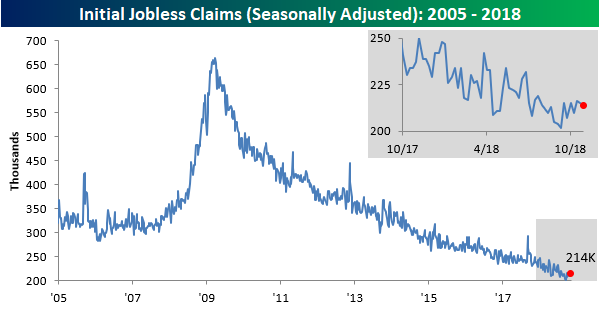 Jobless claims came in right inline with expectations this morning falling from 215K last week to 214K. 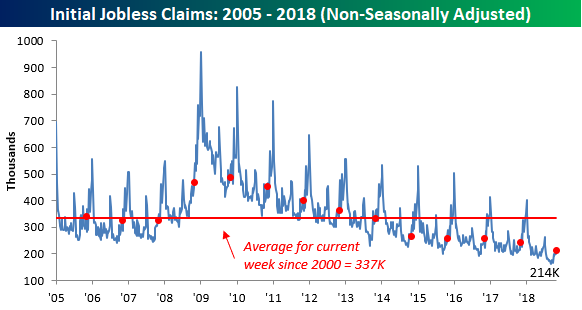 With this week’s report, claims have now been at or below 300K for a record 192 straight weeks, at or below 250K for 57 straight weeks, and at or below 225K for 18 straight weeks. The four-week moving average was essentially unchanged, falling from 214K down to 213.75K. That’s less than 8K above the multi-decade low of 206K that we saw back in mid-September. On a non-seasonally adjusted (NSA) basis, claims ticked up to 214K from last week’s reading of 198.5K. 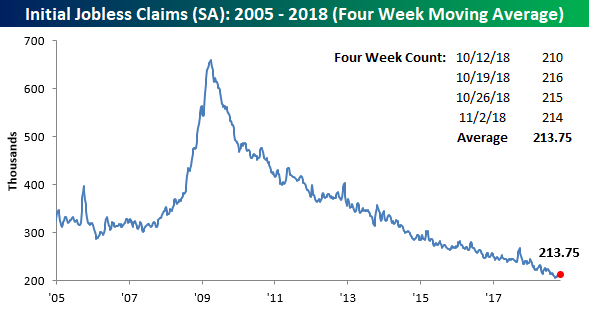 This is the first weekly reading above 200k for NSA claims since late July but is still well below the average of 337K for the current week of the year dating back to 2000. In fact, for the current week of the year, NSA claims still haven’t been this low since 1969.